Not even heavy rain, strong winds, and the reigning J. League champions were enough to stop Yokohama F Marinos as Yasuhiro Higuchi’s men underlined their title credentials with a 3-1 victory away to Sanfrecce Hiroshima. With the hosts struggling to string together their usual passing game on a soaking wet pitch, it was Marinos who seized the initiative and finally forced their way in front three minutes before half time. As the Sanfrecce defence retreated deep into their own area, Mihael Mikić’s clearance only found its way to an unmarked Seitaro Tomisawa who rifled a terrific shot into the top corner from almost 30 yards. Returning from injury, Yojiro Takahagi levelled for Hiroshima soon after the restart after Satoru Yamagishi’s cross was headed down invitingly by Naoki Ishihara. But the visitors remained on the front foot and went 2-1 up when Kosuke Nakamachi broke through a congested penalty area from the left-hand side, playing a one-two with Shingo Hyodo before beating Shusaku Nishikawa at his near post. The points and a fifth straight win were secured with ten minutes remaining when Dutra’s speculative shot slipped out of Nishikawa’s palms into the path of Marquinhos for an easy finish. Urawa Reds will have to break a six-year jinx in order to avoid relegation after falling victim to Ryoichi Maeda’s first league goal of the season, but their prospects look good after coming from behind to beat Jubilo Iwata 2-1. From Ventforet Kofu in 2007 to Gamba Osaka last year, the team on the receiving end when the Japan forward opens his account have always started the following campaign in J2, and after Shinzo Koroki saw his early penalty saved, Maeda took advantage of a moment’s hesitation from Ryota Moriwaki at the other end to put Iwata in front. However, a dominant Urawa eventually forced their way level on 77 minutes when Moriwaki, celebrating his 27th birthday, headed home a corner from Marcio Richardes. Then, two minutes into added time, Koroki’s pressing allowed Genki Haraguchi to steal possession and knock the ball over Yoshikatsu Kawaguchi to maintain Reds’ grip on second place – two points behind Marinos. Their Saitama neighbours, Omiya Ardija, are now up to third after a 1-0 victory away to FC Tokyo extended the unbeaten run that originally saved them from the drop last year to an incredible 16 league matches. Slovenian forward Zlatan Ljubijankič was the hero when he got his head to a free kick from Takumi Shimohira which Tokyo ’keeper Shuichi Gonda had failed to claim. Cerezo Osaka slip to fourth after surrendering their unbeaten record in a 1-0 defeat at Kashima Antlers. Kim Jin-Hyeon’s attempts to dribble the ball out of goal ended in embarrassment as Davi stole in to leave an open net for Yasushi Endo. The first two champions of this decade, Nagoya Grampus and Kashiwa Reysol, remain rooted in a congested mid-table after sharing six goals in a thrilling battle at Hitachidai. Grampus opened the scoring on just three minutes when Teruki Tanaka was left completed unmarked to head in a Taishi Taguchi corner, but Reysol were level almost immediately as Junya Tanaka crossed for Masato Kudo. The home side were looking good and turned things around through Leandro Domingues after Kudo’s initial effort had been blocked by Yuki Honda, but the momentum swung suddenly at the end of the half when Kashiwa midfielder Ryoichi Kurisawa saw red for a second bookable offence. Takahiro Masukawa promptly headed Nagoya back level, but Nelsinho Baptista’s side weren’t lying down and Kudo weaved between two defenders to put the ten men in front once again. It took a 71st minute equaliser from Keiji Tamada to save a point for Grampus, who sit fifth but fully seven points off the pace. Elsewhere, there were celebrations for Albirex Niigata, Shimizu S-Pulse, and Ventforet Kofu as all three won 1-0 away from home to record their first three points of 2013. Sho Naruoka’s first goal since joining Niigata from Avispa Fukuoka was enough to shock last season’s runners-up Vegalta Sendai, while Shimizu forward Bare held off three defenders to register his first strike away to Sagan Tosu. Yukio Tsuchiya’s header sealed Kofu the win at bottom club Oita Trinita. Kanagawa rivals Shonan Bellmare and Kawasaki Frontale remain winless after their 1-1 draw at the Hiratsuka Stadium. Vissel Kobe moved five points clear at the top after Ryo Okui’s solitary strike sealed victory over Montedio Yamagata, who fall from second to fourth. Fagiano Okayama maintained their unbeaten run with a 3-2 win over Consadole Sapporo to go second, while JEF United Chiba are now third after winning 2-0 at Thespakusatsu Gunma. Football Japan's Ben Mabley presents all the latest football stories in a handy, bite-sized format. Take five to catch up with everything you need to know on the J. League, the Japanese national team, and more. 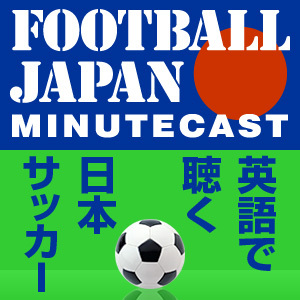 Drag and drop the Podcasting RSS logo into the Podcast screen in iTunes or other similar software to subscribe to the Football Japan Minutecast.